You might not expect radio to be the medium popularizing an old photo, but so it is this month, with a photo of some extraordinary medical students in Pennsylvania in 1885, who were featured on Public Radio International’s “The World.” A version of the story is continuing to air on the BBC World Service in the U.K. 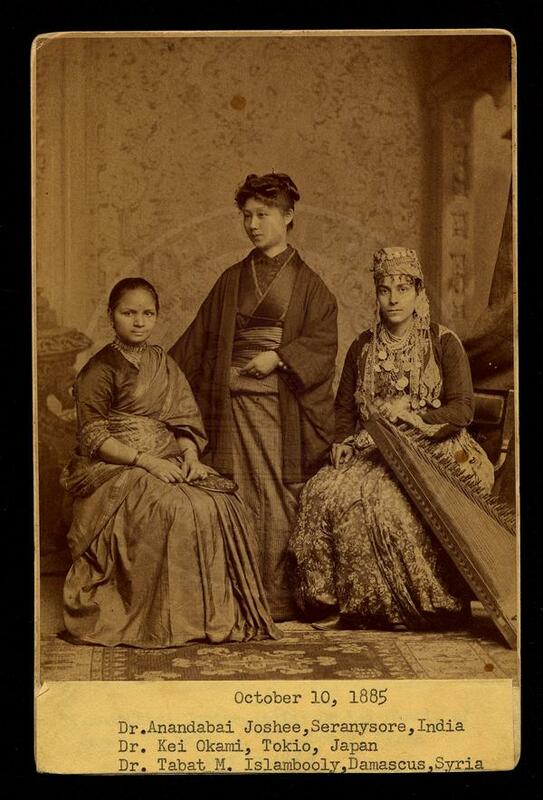 The photo depicts three students from the Woman’s Medical College of Pennsylvania (WMCP), each dressed in the traditional garb of her home country (India, Japan and Syria), at a time when it was unusual for anyone to study internationally at all – let alone women in medicine. The Woman’s Medical College of Pennsylvania eventually became part of the Drexel University College of Medicine. Matt Herbison, an archivist with College of Medicine’s Legacy Center helped PRI develop its story about these extraordinary women and the remarkable opportunity afforded to them by the Philadelphia institution and no other place in the world at that time. It was first women’s medical college in the world, and immediately began attracting foreign students unable to study medicine in their home countries. First they came from elsewhere in North America and Europe, and then from further afield. These women like Anandibai Joshi in India and Keiko Okami in Japan heard about WMCP, and made the decision to defy expectations of society and family and travel independently to America to apply, then figure out how to pay for their tuition and board. It’s a reminder just how exceptional America was in the 19th century. We often spend so much time remembering all the legitimately bad things in US history. But compared to the rest of the world, America was this inspirational beacon of freedom and equality. 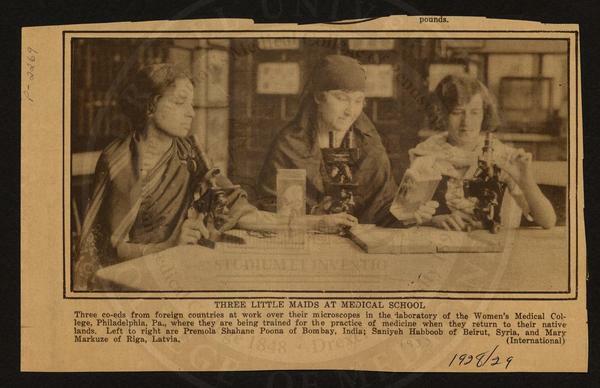 Another photo from the Legacy Center archives depicts three international female medical students in 1928 (from India, Syria and Latvia) at the Woman’s Medical College. While a commitment to diversity waxed and waned throughout the years, it is interesting to note that it was strong in a very public way, at a time when it was not necessarily a popular stance. At the height of the Second World War, WMC admitted students from Japanese internment camps, although it is clear from a few not-so-subtle hints in the Faculty Minutes that not everyone was happy about their presence – one of them was nearly forced out on several occasions, and made to repeat work – all while being closely monitored. Read more and see more photos from the Woman’s Medical College at PRI’s “The World” and the Legacy Center blog. *A correction to PRI’s story: When WMCP opened in 1850, it was located at 6th and Arch Streets downtown, not in Germantown.